Caretaker of Rangoon’s only synagogue dares to dream. Will his children go forth and multiply? 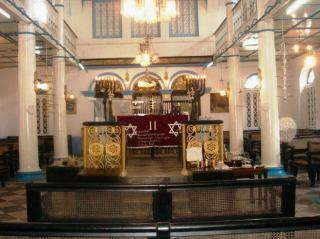 I locate Samuels inside Burma’s only synagogue, busy doing what Jews do well – worrying about the future. Outside the high-ceilinged, blue-tiled Musmeah Yushua synagogue, mostly-Moslem hardware hawkers and textile merchants, some of whom rent stalls from the synagogue, trade and bargain and go about their lives. Inside the synagogue, built in 1886, caretaker Samuels calmly tries to fight the sands of time. Like Martin Luther King, Samuels has a dream. His hope is that the Jewish community of Burma will reverse its declining population and become functional again. Currently there are just 45 Jews in the congregation. “We rarely have a minyan,” Samuels says, referring to the ten men needed for public prayer on the sabbath. The Jewish community has had no rabbi since 1969, no kosher food (but halal Muslim food is a close replacement) and, since no one in the congregation speaks or reads Hebrew, the Torah only gets chanted when officials from the Israeli Embassy in Rangoon participate in Sabbath prayers. Sometimes even the optimistic Samuels fears that his beloved synagogue and Jewish community might become nothing more than a cultural curiosity, as has become the case with the Jewish community in Cochin in neighboring India. Beginning in the mid-19th century, Sephardic Jewish Iraqis, who traded in teak, rice, coffee, jade and gold, were encouraged by British colonial authorities to settle in Burma. The Jewish community grew and at its peak numbered some 2,500 people. But most of the Burmese Jews fled at the outset of World War II, while those few who remained sought greener pastures when Burma’s military government took over in 1962. Samuels, who was born and bred in Burma, hopes that his children will be part of the solution. The only single Jews for these young people to marry are relatives, Samuels explains, so he plans to send his daughter Diana, 21, and later his other daughter Kazna, 19, and his son Sammy, 16, to live with relatives in Israel, UK, or the States. There he hopes they will wed and procreate. And then, he hopes, they and their families will return. Help might also come if the country continues to open up to foreign investment. The logic is that with a more open business environment some of the émigré Jews might be willing to come back. Although human rights activists urge against foreign investment in Burma, development continues at an aggressive pace, as witnessed by the 18 foreign hotels under construction in the capital. But for the moment, Samuels, thin and serious and dressed in a Burmese longyi sarong and a short-sleeved batik shirt, relies on the kindness of strangers. Visiting Jews drop a few dollars into the collection box, and richer philanthropists have helped to refurbish the white-tiled sanctuary where the torahs are kept. Of more immediate concern to Samuels, who inherited the role of caretaker from his father Isaac, who died in 1978, is the possibility that the government will raze the Jewish cemetery, where some 700 people are buried. Like neighboring Chinese, Bahai’i, Moslem, Parsi, and Armenian cemeteries, the palm-tree lined Jewish graveyard lies on prime commercial land in the center of rapidly-expanding Rangoon. The government owns the cemetery land, as it does the land on which the synagogue stands. Near the end of my visit to Rangoon someone calls to me as I walk down a market street. It is R., my friend from the guest house. I’m touched. Nobody has prayed for me for a while, at least not that I know of. I certainly don’t mind. And Samuels, I’m sure, could use a bit of help.